It’s almost here! WIPs WrestleMania!! Tomorrow, July 1st, it begins!!! They are in varying degrees of completion, so some will be more difficult to finish in time than others. 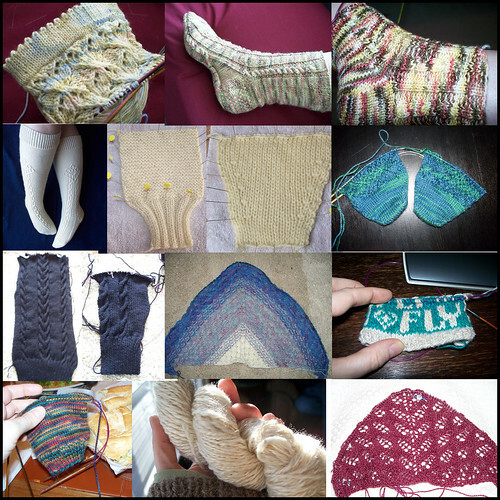 I told my teammates, though, that I absolutely have to finish the Master Knitter Level 1 assignment (a couple of the MK swatches are pictured in the middle). I’m hoping this gives me the motivation to finish it!! I’m in two teams: Team Charlotte Purls (I’m team captain!) and Team LSG. Go Teams!! Monogamy works in marriage, but knitters need to be a little, well, loose. Don’t beat yourself up if you don’t finish everything. Just join us other humans and flaunt your UFOs.